Maldives Explorer is a high standard dive liveaboard with affordable price, it offers liveaboard trip with different route options in the Maldives. It can accommodate 16 - 22 guests per trip. Maldives Explorer is a high standard dive liveaboard with affordable price, it offers liveaboard trip with different route options in the Maldives. It can accommodate 16 - 22 guests on board. Maldives Explorer is a 33.5 meters long, 10.5 meters wide professional dive liveaboard with wooden hull, cruises at 12 - 14 knots per hour. It was originally built in 2012, then it was completely refurbished in 2018 with brand new materials and high quality facilities. This will guarantee a smooth operation! 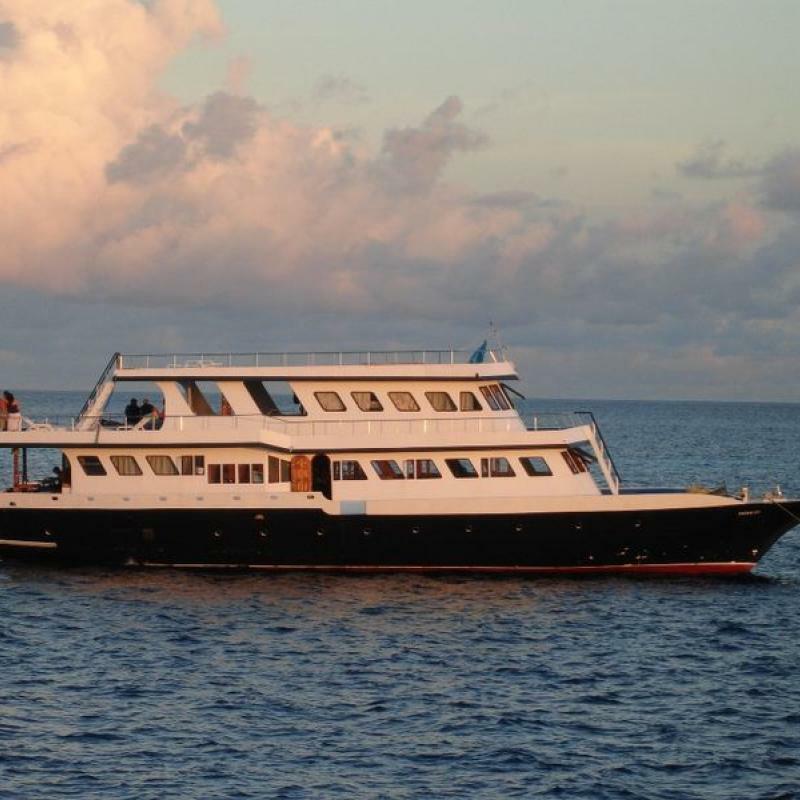 Maldives Explorer is a classic liveaboard with exceptional onboard facilities. The boat is spacious to deliver each guest an intimate vacation. On the main deck, there are the kitchen, both indoor and outdoor dinning areas, an indoor lounge area with a 32 inch full HD TV and Blu-ray disk player with surrounded speaker, media library, board games, Karaoke System and WiFi Access. On the upper deck is the bridge, the captain's cabin, an outdoor deck with lounge chairs. Finally, you will find a large sundeck (with and without shade) with comfortable sun loungers. Maldives Explorer promising guests a team of exceptional crew with experienced dive guides and good quality of food and quality service. 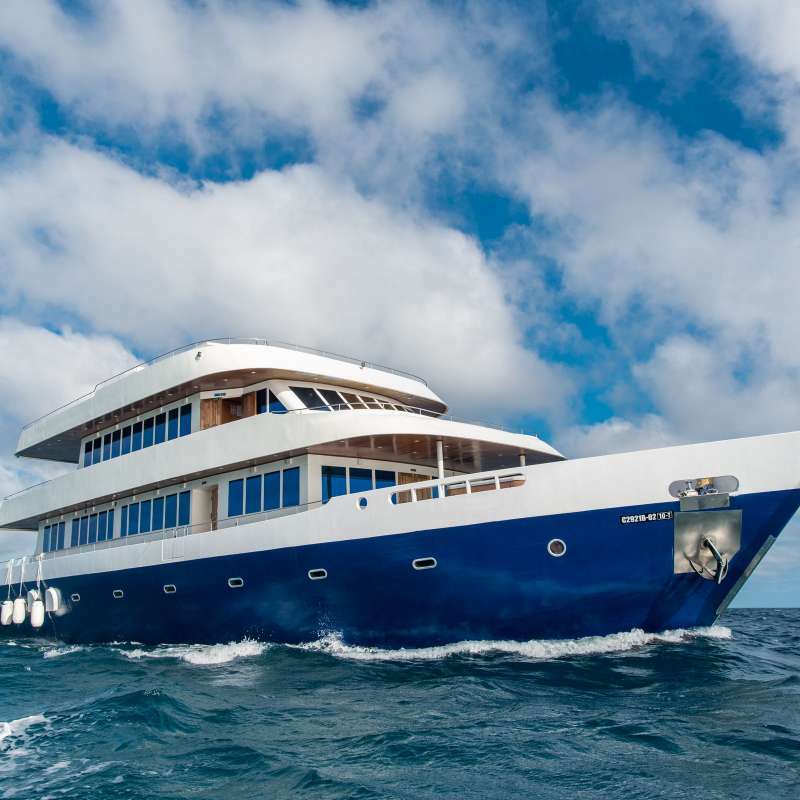 Above all the luxury liveaboard is ideal for diving, surfing and snorkeling cruises. 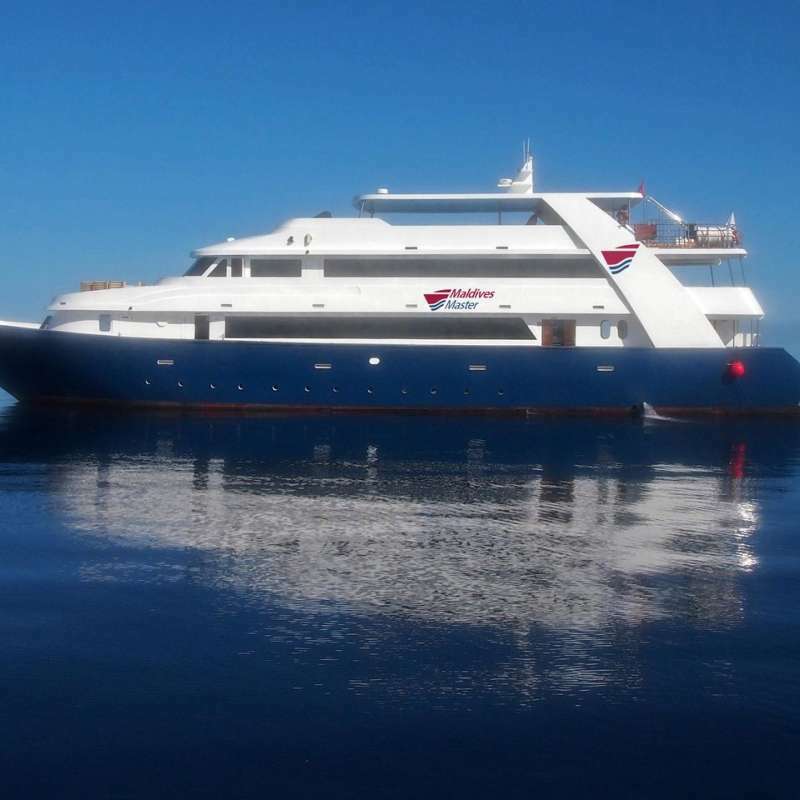 Maldives Explorer will be joined by a spacious dhoni, where all diving equipment will be stored. There are 2 Bauer Mariner 320 compressors have ample of capacity to fill the tanks in short time. As well as a spare Bauer Mariner 250 compressor to be on the safe side in case a technical problem would occur. 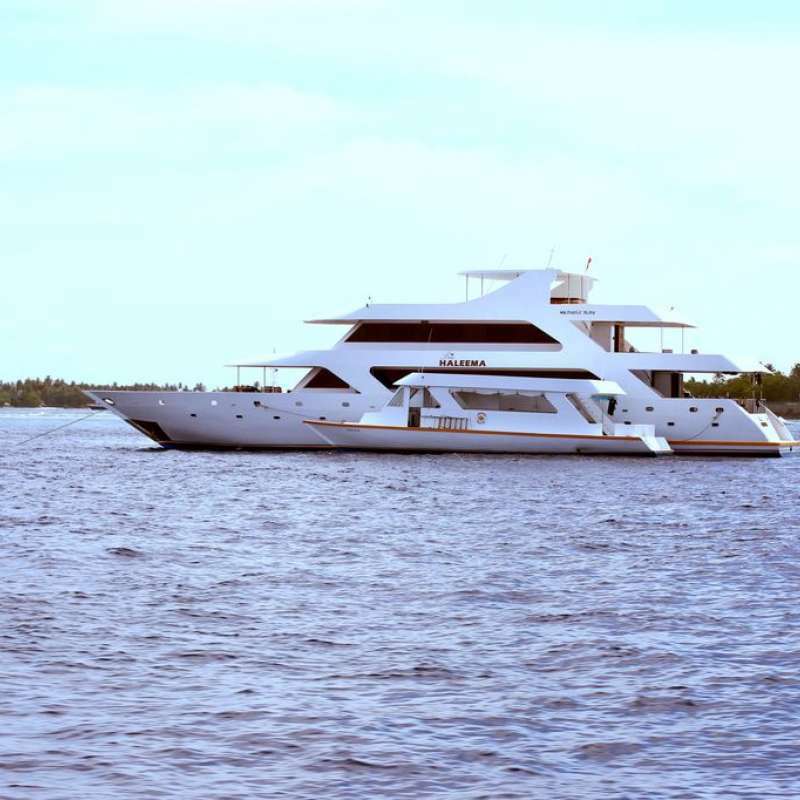 Maldives Explorer has 8 adequate sized cabins for up to 16 guests in scheduled trips. When it comes to charter, the guest can choose triple share, then it can goes up to 22 guests max. All cabins are equipped with ensuite bathroom, air conditioning and spacious storage area. Located on the upper deck, the best cabin type onboard, each cabin comes with one double bed, lots of seaview windows. Located on the main deck, this cabin comes with one double bed, it can be adjust into two single beds side by side upon request, seaview windows. Located on the lower deck, these cabins has double, twin and triple accommodation, some of them comes with one double bed and one single bed, some of them comes with three single beds, portholes. Located on the lower deck, this cabin comes with the capacity to accommodate 4 guests. It comes with one double beds and two single beds, also can be converted into 4 single beds if needed, portholes. Day 5 : With the depth of around 12 to 16 meters, Panathone is a famous manta site with high possibility of manta feed sighting outside the atoll during outgoing current. During incoming currents on the ridge of the atoll, you’ll see what is known as the “Shark City” and dozens of big grey reef sharks mesmerizing your every thought. Dive sites: Rangali Manta, Rai Dhiga, Panathone. (3 dives). After dozens of dives our staff will invite you a BBQ dinner. Day 7 : Watch beautiful movement of large school of grey reef sharks big schools of snappers, jack fishers, fusiliers, barracudas and dog tooth tunas at Bathala Maagau. Fish head is the wonderful place to view schools of fish and many other marine life. If time permits, last dive at Fish Tank will give amazing movements of fish life, specially guitar sharks and rays – Eels are the stars of the show. Dive sites: Fish Head, Fish Tank (Kaafu) / Kuda haa. (3 dives). Day 8 : Our amazing crew will assist you to cleaning and washing your dive equipment and help you for packing if required. We will guide you through domestic flight to your International Flight checking. Our Team is guaranteed to provide assistance throughout your trip until the very last moment at the Maldives. Itinerary may change anytime according to weather conditions, last minute request & other issues. Depends on the length of the trip, usually, two ways domestic flights between Male (Velanaa International Airport) and Kooddoo / Kaadehdhoo will be invoveld. Hanifaru Bay is a marine protected uninhabited island located in the Baa Atoll of the Maldives Islands. Its size is no greater than that of a football field and yet it has become one of the hottest spots for underwater photographers. The reason for this modern day phenomenon of underwater diversity is because plankton blooms between the months of May and November – a very unusual phenomenon – attracting manta rays by the hundreds. At any one time at Hanifaru Bay, there can be up to 200 manta rays feeding off the coral reefs as well as plenty of whale sharks which do the same! Hanifaru Bay has become the world’s largest manta ray feeding destinations.